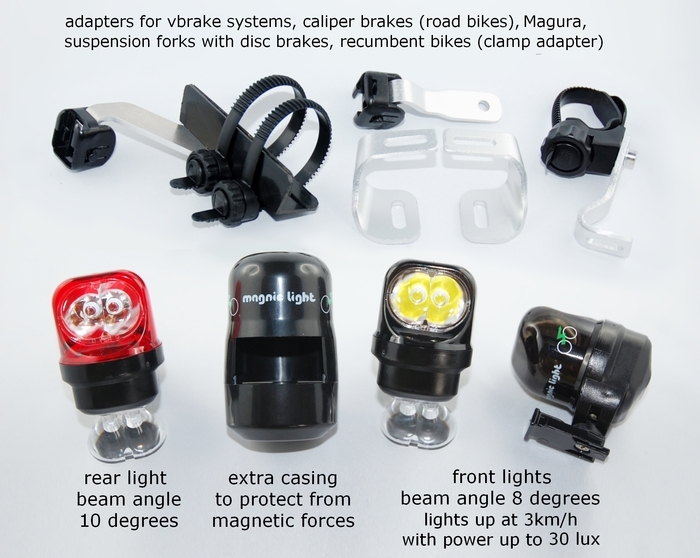 After examining various several flawed ideas for bicycle lights on Kickstarter I was pleasantly surprised by the Magnic bicycle light. It's a project from a German team, since as Germany is home to a number of notable manufacturers of bicycle lights they need a very good product to compete, and it seems they have. Some other systems with magnets in the spokes exist, but these can only emit a faint flicker once the magnet passes the light. The Magnic bicycle light is unique in that it has its built in generator and does not require batteries or additional parts attached to the wheel. But unlike traditional rim dynamos they do not have any contact friction which should make them more efficient. The Magnic light promises a steady beam of light even at speeds as low as 3 km/h. Compared to dynamo hubs they do not require replacing/rebuilding the wheel, and don't have any wires running to the light. Unlike all other bicycle lights I have seen n Kickstarter, this is the first time that the makers do not make any unsubstantiated claims regarding safety on their Kickstarter page. Instead they just state that the light conforms to the German traffic regulations, which happen to be the most strict in the world. The rear light has a blinking mode, as this is illegal in Germany they have a special German version that does not feature this blinking mode. Additionally they also provide information about the wavelengths of the light and how they engineered the lenses to be visible, yet not to blind others. What is this? Somebody actually thought about how the lens design has to comply with traffic regulations. On the other projects I have often remarked that the people in pictures and videos using the products were violating various laws, and the manufacturers own recommendations. Even though no safety claims are made here I wanted to compare it. I did see some pedals without reflectors, but those shots are either not on the road or not in total darkness. At least in a number of the shots the bicycles were street legal, and even the people were wearing helmets, that's a first! Like I mentioned many times before there is no single perfect bicycle light, although this light has a lot going for it, it is no exception. In this case the makers do a pretty good job of making clear on what kind of bicycles the light will fit, so I am not going to go into those limitations. The light is intended to be mounted on the mounts for V-brakes. Although various other mounts are available for bicycles that do not have V-brake mounts these lights are limited by the fact that they have to be positioned near the rim of the wheel and cannot work otherwise. For the front wheel this is actually a pretty good position, at a good height above the pavement. The angle of light can be adjusted so that the beam will shine in the right direction. It's a different story for the rear wheel. while the rear light has a slightly wider beam it can still easily be obscured by a rear rack and any luggage on it, and even the wheel itself from some angles. Fortunately the front and rear can be bought separately. With these mounts you can attach the lights in many different ways, as long as it close to the rim. The design with contactless magnets would suggest that it would be relatively easy to make the lights completely waterproof. On the Kickstarter page there is no mention of the word "water", "weather" or "seal" which I find slightly puzzling. I can only assume this is because the light is not waterproof or even resistant. Since the lights are quite expensive and will work all the time when they are on the bicycle they are intended to be removed regularly since they are only needed at night and should not be left on the bicycle unattended. To accommodate this there is even a protector box to keep the light in which protects bank cards from being damaged by the strong magnets in the light. This is very thoughtful. The only possible issue I can think of is that the area around the V-brakes can get quite dirty and you could get dirty hands, but the protector box will at least keep the light from getting other things dirty. Out of all the bicycle lights I have seen on Kickstarter this is the first one that I would call truly innovative. There has never been another light that is powered in such a way. The product sells itself without resorting to unsubstantiated safety claims and the makers do a decent job of explaining on what kind of bicycle the light will work.